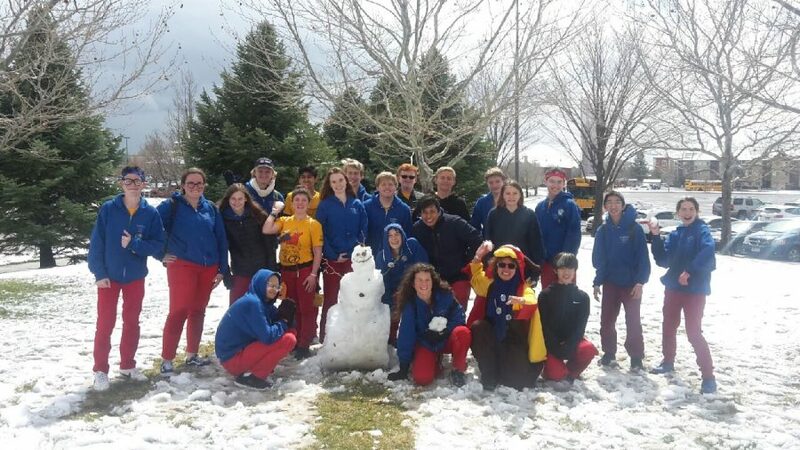 Paradoxians created a snowman between qualification matches on our second day of competition. San Dieguito Academy’s robotics organization Team Paradox 2102 competed at the Utah Regional last weekend, making it into the semi-finals. Having earlier qualified to compete in the FIRST World Championships in Houston, our goal was to practice and, hopefully, win the competition. We also wanted to make any modifications before heading to the championships on April 17-20. The Utah Regional ran similarly to the Del Mar Regional. Fifty teams from around the world came together to compete in this year’s challenge, Destination: Deep Space. The objective was for teams to construct a robot during the six-week build season. The robot was supposed to lift itself approximately two feet from the ground and deliver cargo (large dodgeballs) and hatches (large disks) to the cargo ship and rocket ships. The first day-and-a-half of the competition were qualification rounds. We ranked 4th overall with a record of 10-5-0. Throughout all of the qualification matches, I was head scout again, tracking every team’s performance on each aspect of the game. Between matches, however, I had the opportunity to walk around the pits. The pits are sectioned-off spaces for each team to house their robot, tools, parts, and more. The most fun aspect, in my opinion, is receiving every team’s button. It is tradition to trade and collect them at every regional attended. That said, I probably have over five-hundred buttons since becoming a Paradoxian. Midst the strong competition, us Californians experienced something truly magical: snow. Senior Jana Roper and I luckily looked out of our window before falling to sleep. To our surprise, white bundles of joy fell from the sky. Ecstatic, we ran outside in our pajamas (and she did without her shoes). Our team joined us in what became a giant snowball fight. I thought this was a great way to bond as a team before the next day’s remaining qualification rounds and elimination rounds. Before the elimination rounds, the top eight teams picked two teams to be a part of their alliance. Given that I was head scout, I had to relay the information I tracked to our Co-Engineering President Ryan Moore before selecting them. We spent the previous night going through data, rewatching matches, and finalizing our top choices. We chose Provotypes 6844 and Red Rock Robotics 3006 to be on our alliance. In the quarterfinals, we lost our first match due to losing connectivity during the last 30 seconds. However, we quickly fixed the problem, returning to win the second and tiebreaker match. Going against the 3rd ranked team overall in the semifinals, we lost our first match by three points. We thought that, similar to the quarterfinals, we could come back and win the next two matches. We were faced with a bigger problem, however. In the middle of the second match, our opponent heavily defended Flip, our robot. They pinned Flip against the arena walls and slammed into us as the robot tried to escape. Unfortunately during one collision, our intake which picks up the cargo shifted, getting tangled with the elevator that allows us to climb and gain 15 points. Lacking the ability to climb led to a defeat. Spirits held high, the event coordinators played Cotton Eye Joe as teams queued for the finals. Our team raced out of our seats to the arena, where we taught fellow competitors how to dance along. After the remainder of the competition, our team was awarded the Quality Award sponsored by Motorola Solutions Foundation. It acknowledged our innovative and clean robot design and the professionalism shown throughout the team. Now, we cannot wait for the FIRST World Championships in Houston on April 17-20. Paradoxians are excited to compete one last time this season. Congratulations !! A wonderful team effort. And of course the snow was the icing on the cake (no pun intended). On to Houston, with our very best wishes. Love to the whole team. Now I’ll have to look up Cotton Eye Joe.